"I am having too much fun to keep it to myself. 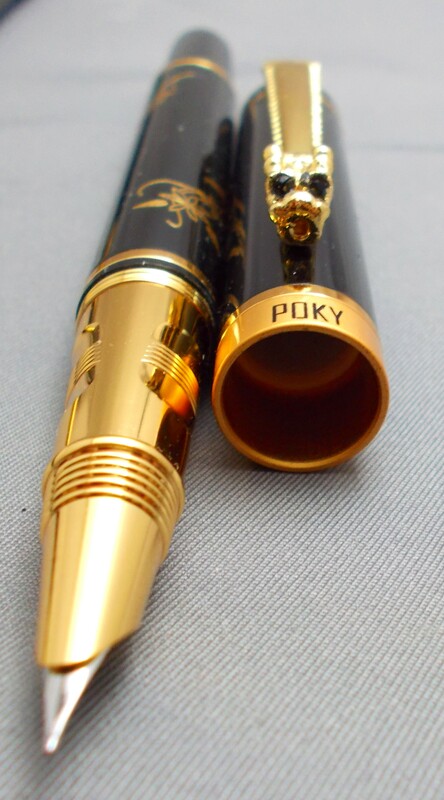 The Poky Dragon Flower and Great Wall are delightful and distinctive. Easy to hold. The ink flows evenly. Speaking of ink, the colors from the Private Reserve are fantastic. 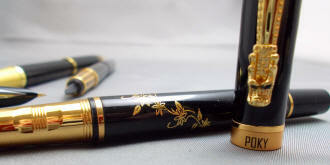 It is so evident that you do check each nib for perfection. They perform as promised. I have a few inexpensive pens from other sources. 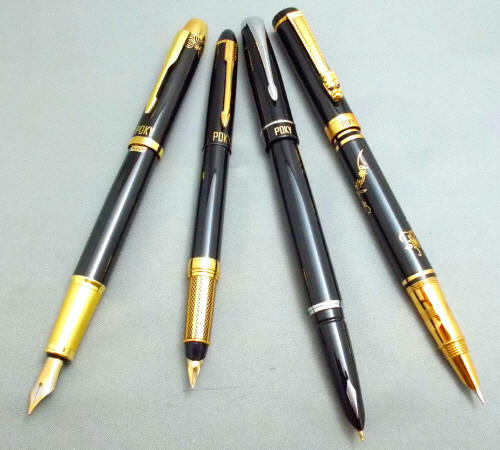 Those nibs needed your help. 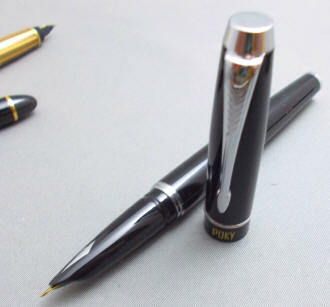 Scratchy and leaky nibs are nibs that never met His Nibs...Thanks for your personal care of the pens. That makes for enjoyable writing." Although each is quite distinctive in design, there are enough similarities in construction of these Poky models that I've decided to group them together. Each of the Fabulous Four shares a black cap and barrel, golden furniture in three cases, and quite similar sizes -- again in three of the four pens -- and Poky displayed on the cap band. The three larger models measure between 5-1/4" - 5-1/2" capped, about 6" posted and about 4-3/4" with cap held aside. The slightly smaller #1 Golden Arrow measures 5-1/4" capped, 5-1/2" posted and 4-1/2" with cap aside. Taken in order, the #1 Golden Arrow pays homage to the older Parker-style arrow clip and is the slimmest of the quartet, in keeping with its length. 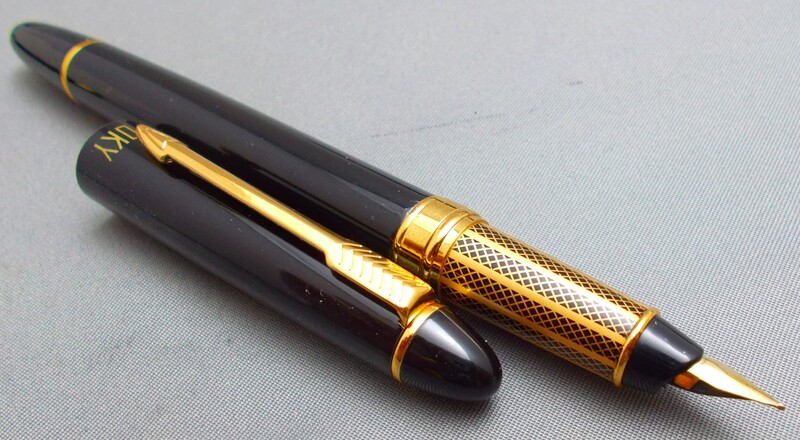 The section is rendered in a latticework design and the semi-hooded nib (the hood is somewhat reminiscent of that on the Parker 45) and an unadorned -- but interestingly shaped -- gold-plated steel nib in a western fine. 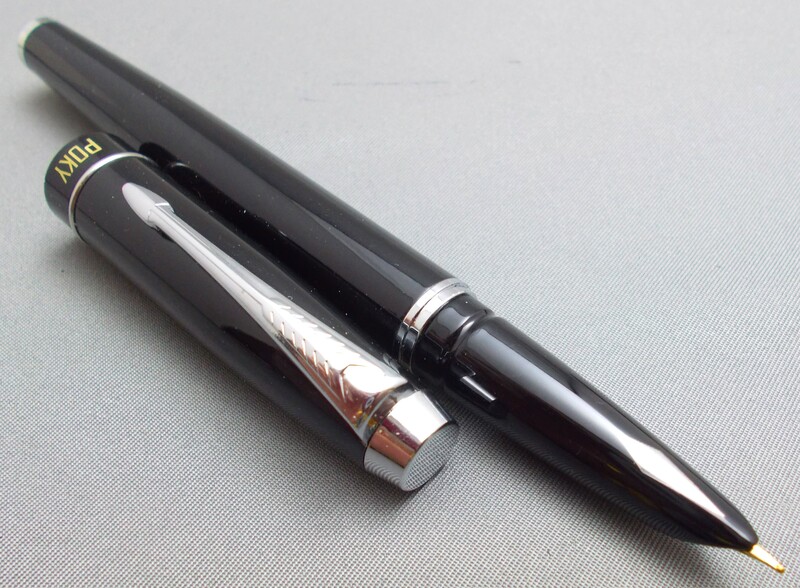 The #2 Duo61, with chrome furniture, sports a more recent looking Parker-style clip and a cap that reminds one of a modern Parker Duofold. 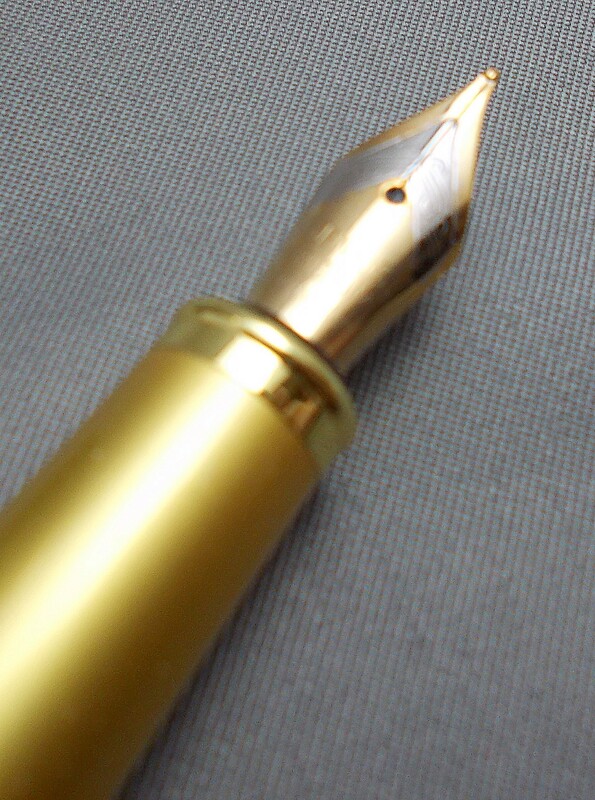 Removing the cap however, reveals a schizophrenic Parker 61-style hooded nib and metal inlay in the hood! The gold-plated steel nib is equivalent to a western fine. The #3 Dragon Flowers departs significantly from the Parker-style clip, employing a Chinese dragon instead! 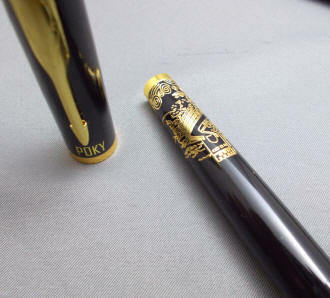 Most dragon-clip pens gaze at you with red 'jewel' eyes. This fellow decided to match his color scheme, having black ones. The barrel displays a raised flowering vine design -- which I'll leave to the botanists among you to identify. The gold furniture extends to the section and hood, with textured finger-pads for grip. The chrome-plated, hooded nib is again a western fine. The #4 Great Wall returns to an arrow clip, but a more stylized one that Parker wouldn't quite recognize. The cap near the top of the clip has a raised design of Chinese clouds, which are reprised at the bottom of the barrel -- below the Great Wall. That departs a bit from the reality that most of us are familiar with , but it actually works well visually. 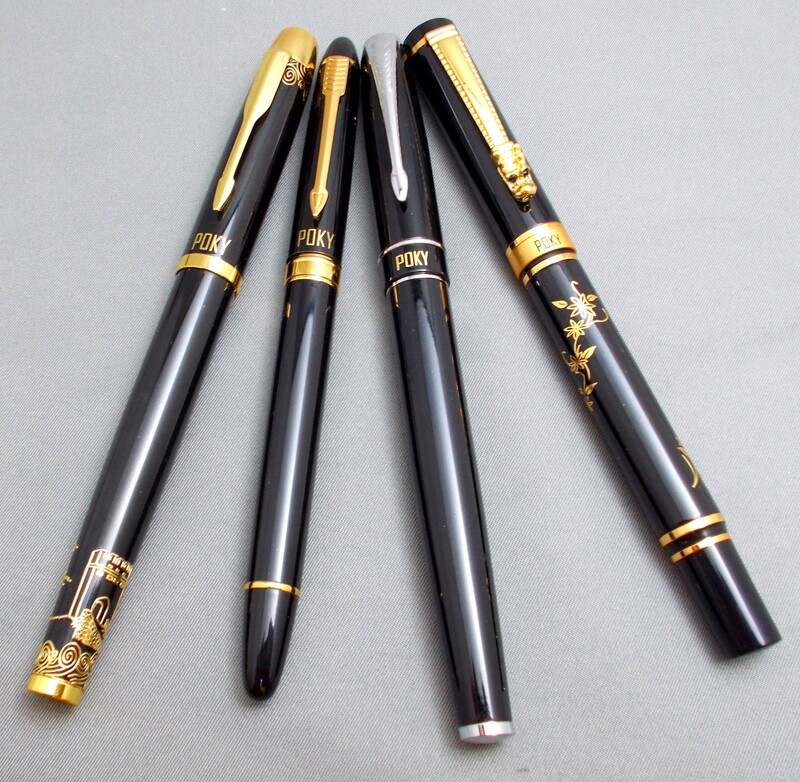 This is the only model of the four with an open spear nib, and it's slightly broader than the other three, but still within a western fine range. 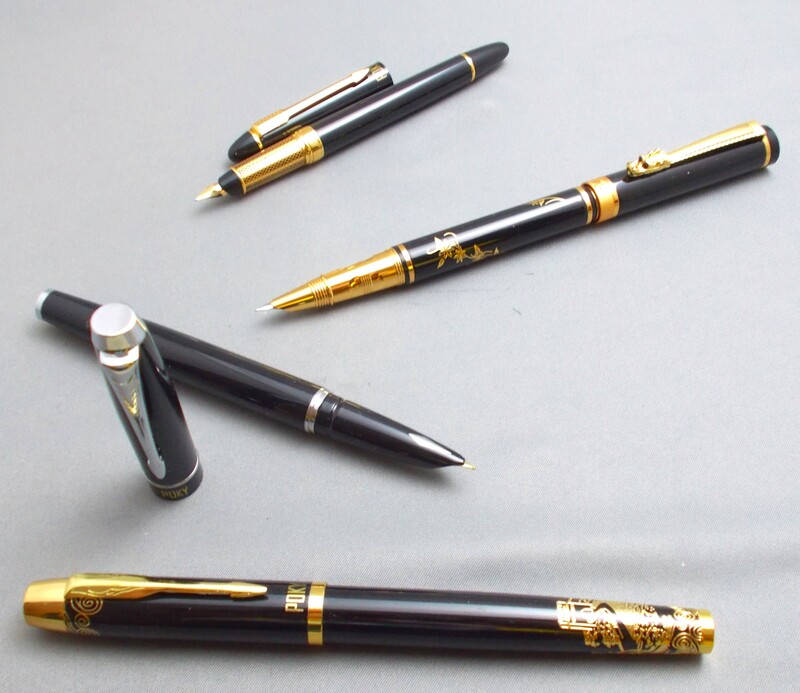 All four pens include some version of a piston converter for bottled ink, and will also take International-style cartridges, such as those from Private Reserve. 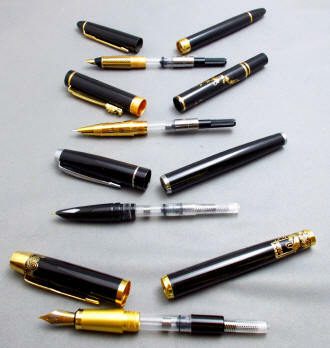 As with all new pens, I recommend to run a dilute solution of dishwashing soap (two or three drops to a small bowl of water) through a new pen a few times, followed by water only. Step one is effective at removing manufacturing oils that can tend to make the ink less than enthusiastic in heading from the converter/filler to the nib, and step two removes the traces of the detergent you've used...which tends to have the opposite, diuretic effect.